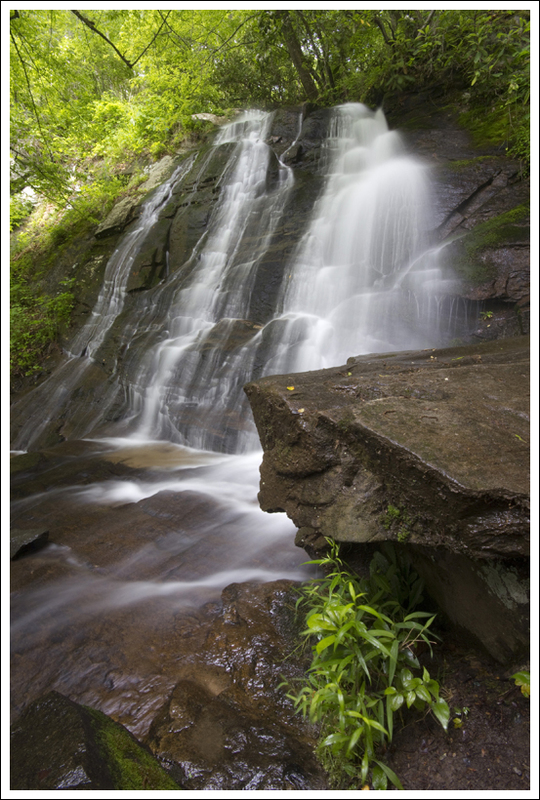 Toms Branch Falls is the first waterfall you’ll come to on the loop. It’s only about a quarter mile from the parking area. Below: Another angle of Toms Branch Falls; Horseback riders love the Deep Creek area; Tubers on Deep Creek; Christine enjoys stream scenery. We rolled into Bryson City, NC around 2:15 and almost immediately headed out for a hike. We were tired but our hotel wouldn’t let us check in even 45 minutes early. Evidently, the Microtel in Bryson City is very strict with their policies! We decided to do something close by, so we headed to Deep Creek campground for this hike with three waterfalls. We knew we were getting close to the campground when we saw tons of “TUBES” signs. People were waving as we drove by, hoping that we would stop and rent tubes from them for floating down the river. We arrived and got changed in the parking lot and made our way to the trailhead. The parking lot was crowded, mainly for tubing people. We followed the masses heading out carrying their inner tubes to their drop-in spots. We started on the Deep Creek trail and soon passed the junction with the Juney Whank trail on the left. In just about .25 miles, we came across the first waterfall on the right, Toms Branch falls. This is a gorgeous waterfall that drops about 60 feet over several different rock shelves before plummeting into Deep Creek. We saw several people floating down the creek as we stopped for some photographs. Adam enjoys beautiful Indian Creek Falls. 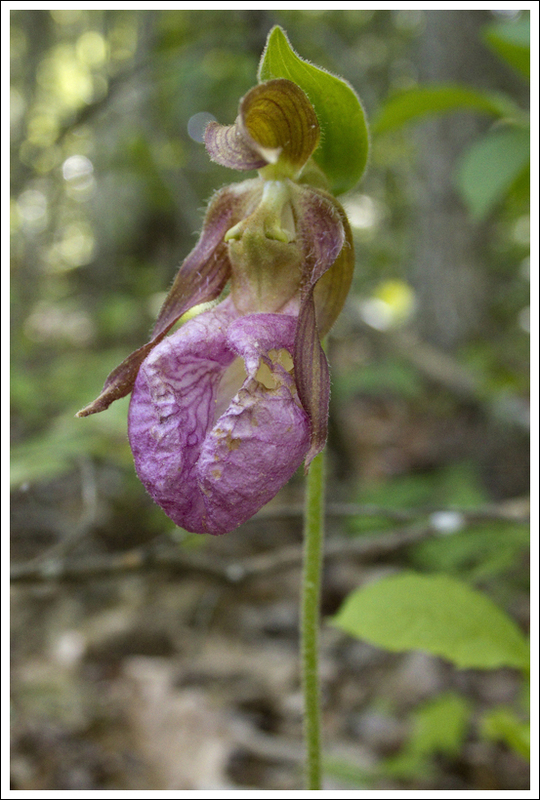 Below: We spotted pink lady’s slippers along the trail. They were a little tattered at the end of their blooming season; Adam climbs the trail. At .75 miles, we reached the junction with the Indian Creek Trail. This is actually the last spot where people can drop their tubes into the creek, but we continued on the Deep Creek trail. At 1.75 miles, this trail intersects with the Loop Trail. We took a right on to the Loop Trail which starts a steep ascent. 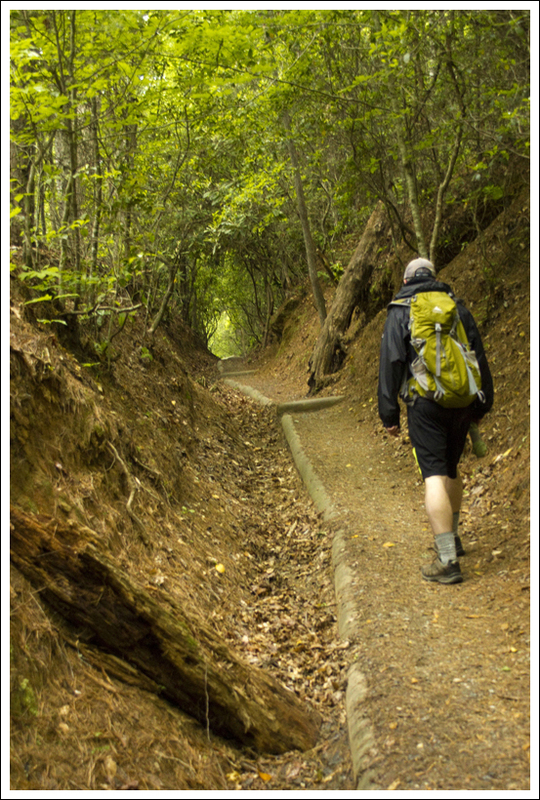 At 2.4 miles, the trail reaches its peak and intersects with the Sunkota Ridge Trail. Continue on the Loop Trail which now descends at about the same rate as it ascended. At 3.0 miles, you reach the junction with the Indian Creek Trail. Take a right here. 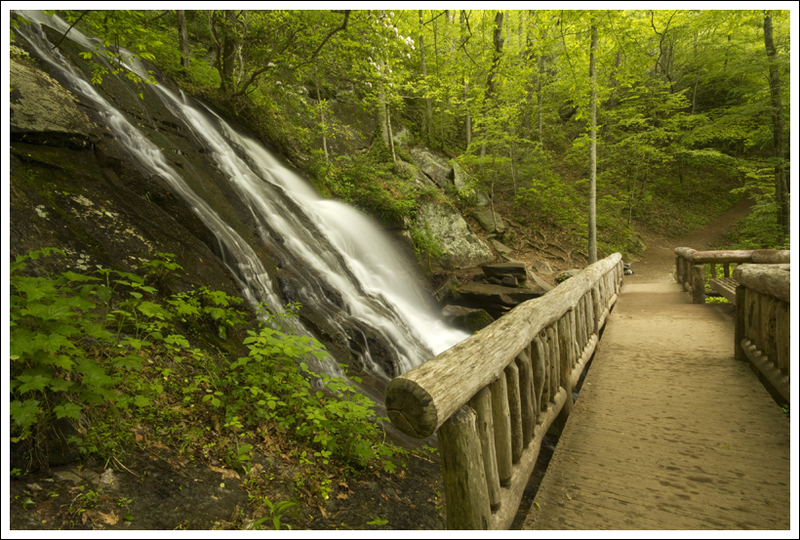 At 3.8 miles, you’ll see a side trail that descends to Indian Creek Falls. 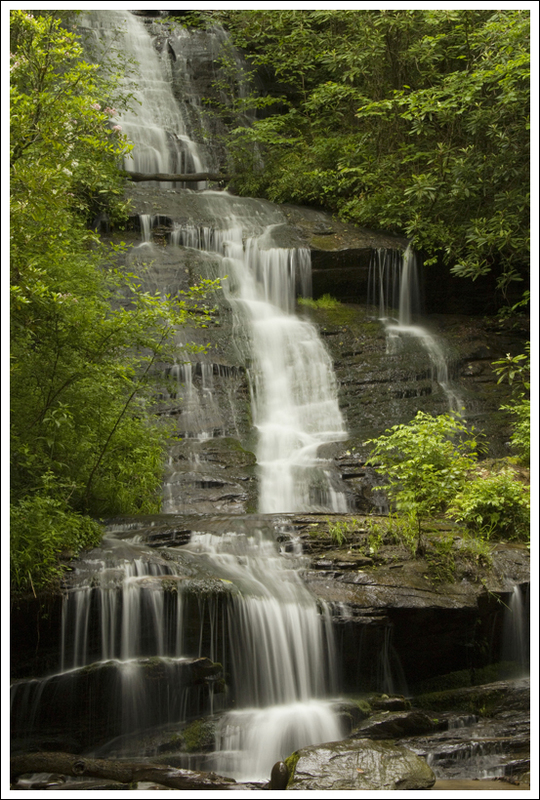 Indian Creek Falls is a wide waterfall that has a gradual, sliding cascade into the water. After taking in the sight, head back to the trail and continue to the right. Shortly after passing the waterfall, you will reach the junction again with the Deep Creek Trail. Take a left here to retrace your steps. You could make this a shorter trip by initially taking a right at the junction, but we enjoyed putting a little extra effort to earn all three waterfalls. 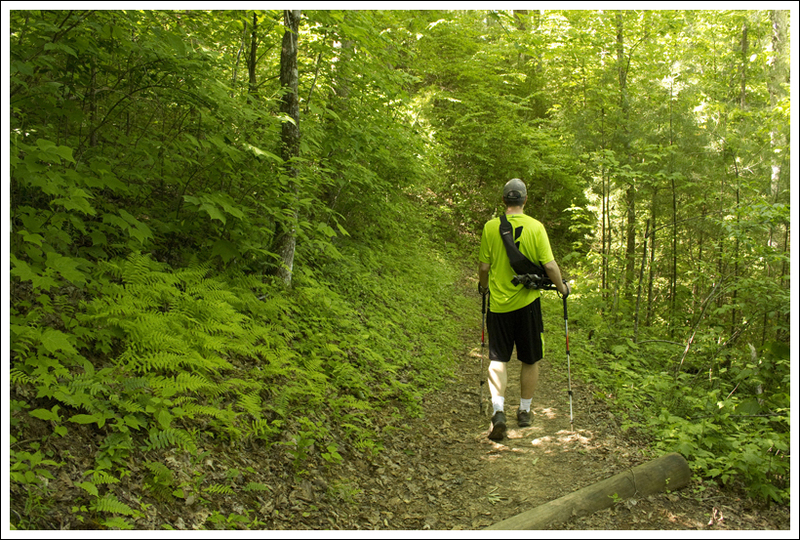 Right before you reach the parking lot, you’ll see the junction trail again with the Juney Whank trail at 4.5 miles. Take the steep trail to the right up for .3 miles. Once you reach the top, you’ll see Asian which points you to the next waterfall. Descend down a short path and you’ll reach a footbridge and the waterfall. 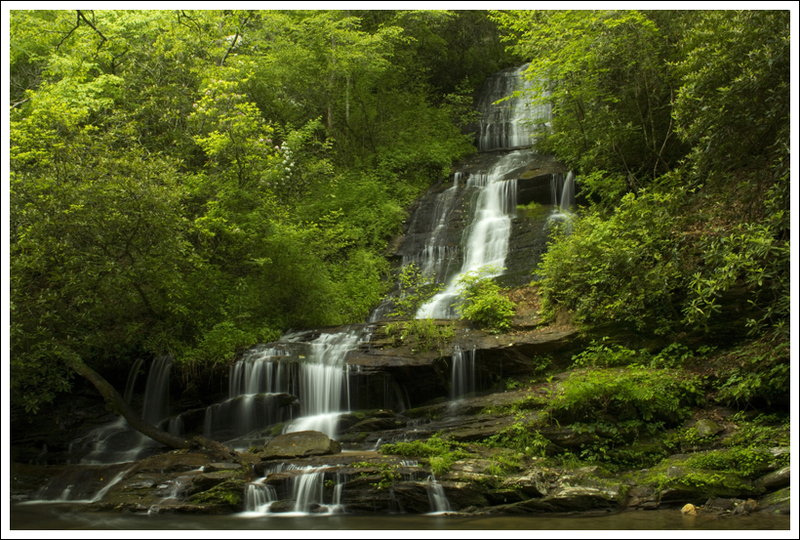 Juney Whank Falls is another great waterfall that plunges down after about a 80 foot cascade. Continue to the other side of the footbridge and continue on the trail, heading left at the first junction. The trail descends rather steeply. You’ll see signs that lead you to the parking lot and back to your car. 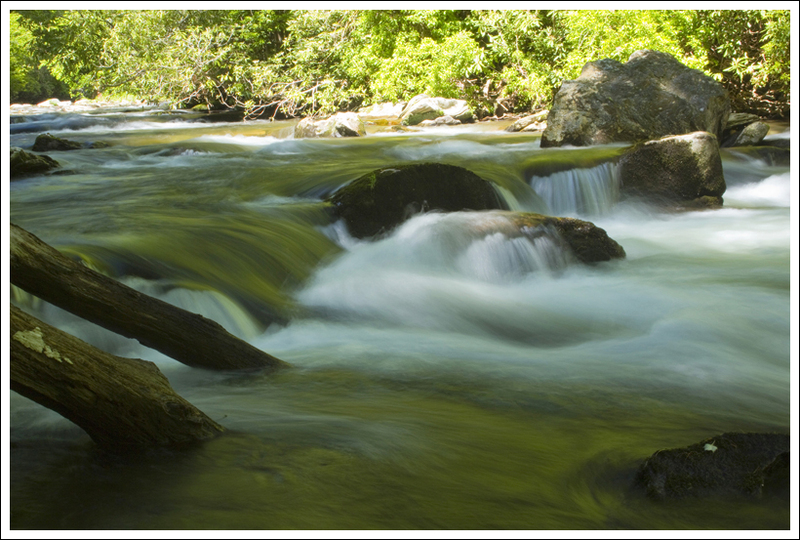 The streams in the Smokies are so beautiful! Below: Since the trail is popular with horseback riders, there is a lot of manure along the way. 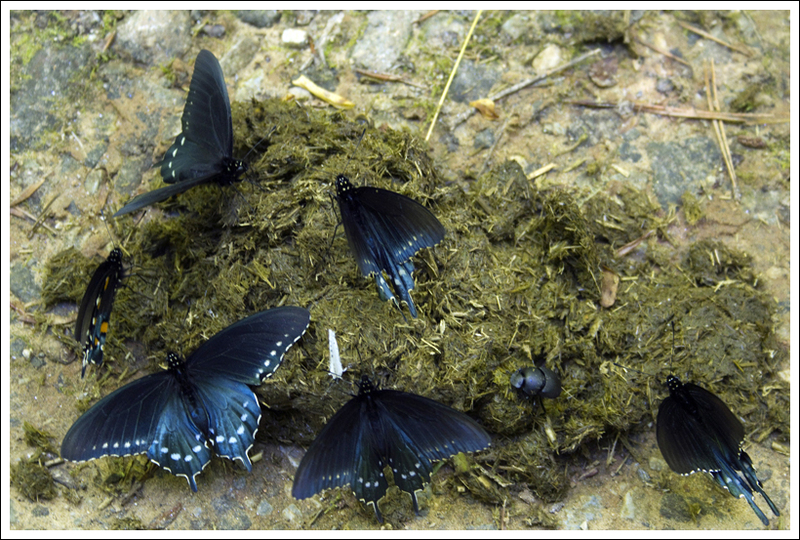 Butterflies apparently love manure! ; Beautiful Deep Creek; Adam on the loop portion of the trail. We had a great time on this trail that maximizes your waterfall experience. The Deep Creek Trail and Indian Creek Trail both gave you great creek views almost the entire walk and it was fun to watch everyone float by us. I can see why this is such a popular place to hike and tube for families. We saw one person with a foot cast and met one woman with a pacemaker along the way, so most people should be able to handle this. 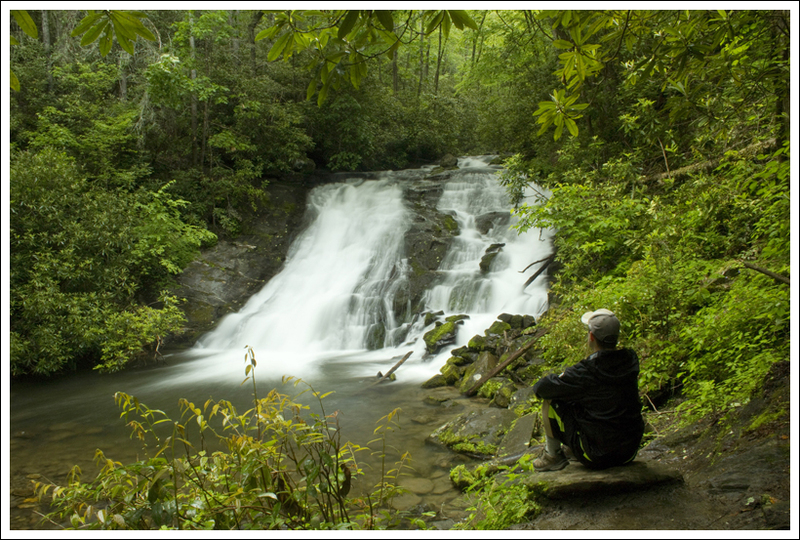 If you want to see some great Smokies waterfalls, this is a hike for you! We arrived to the area mid-afternoon on the Saturday of Memorial Day weekend. We tried to get into our hotel one before official check-in, but the desk clerk turned us away. 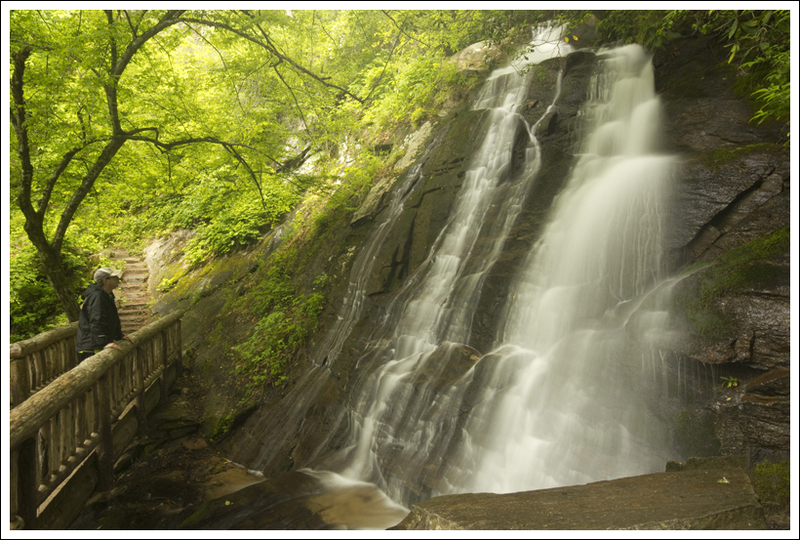 We decided to drive over to the Deep Creek Campground, and check out an easy loop hike that took us by a couple waterfalls – Toms Branch Falls and Indian Creek Falls. I changed clothes in the crowded parking lot. Let me tell you… switching from jeans and a shirt into shorts, wicking shirt and sports bra without flashing anyone is quite a feat! We started off along a wide, road-like trail that followed parallel to Indian Creek. It was packed with people out enjoying the warm, sunny weather. Apparently, the Smokies have had an exceedingly cold and wet spring, so the bright, 80-degree Memorial Day weekend was a great chance for everyone in eastern Tennessee to go outside. 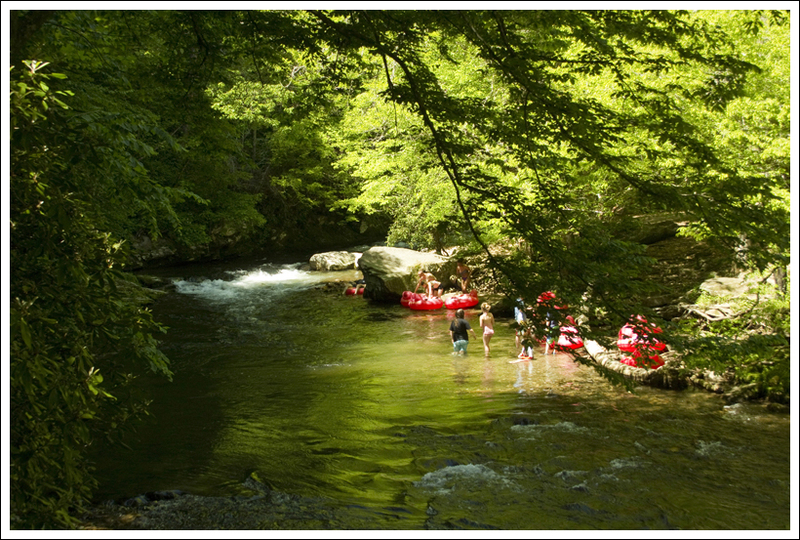 Deep Creek is very popular with tubers. All up and down the road leading to the campground, various vendors have set up shop renting tubes for roughly $5 a day. Once you have a tube, you walk about a mile up the trail, and then bob and bump along the shallow, but rapid-y river. It looks like a lot of fun! As hikers, we were in the definite minority. Juney Whank may be the prettiest waterfall on the loop. Below: Adam enjoys the falls from the bridge; Juney Whank is beautiful from every angle; Below the falls. Walking along the Deep Creek Trail for about .25 miles, we came to the lovely Toms Branch Falls. It’s a tall waterfall that enters Deep Creek from the bank opposite the trail. Very impressive! We walked along the creek until reaching a junction that makes a lollipop loop on the route. We decided to follow the longer arm of the loop so that we could visit Indian Creek Falls closer to the end of our hike. The trail mostly followed the stream before turning and climbing steadily uphill for about half a mile. At the highest point, the trail met the Sunkota Ridge Trail, which leads to higher elevations and a larger trail system. We remained on the loop and descended another half mile to meet another trail junction. At this junction, we met a group of horseback riders. One rider was really struggling with her mule. She had dismounted because he had become so skittish. When we passed, he was bellowing and dancing around. She eventually got him under control and was able to ride on. He looked like quite a handful though! In a few more tenths of a mile, we came upon Indian Creek Falls. These falls are not as steep, and are made up of a couple of small ‘shelf-drops’ before falling into one larger fall. Very beautiful! About a tenth of a mile past the falls, you join back up with the beginning of the lollipop loop. From there, just follow the trail and the tubers back to the parking area. 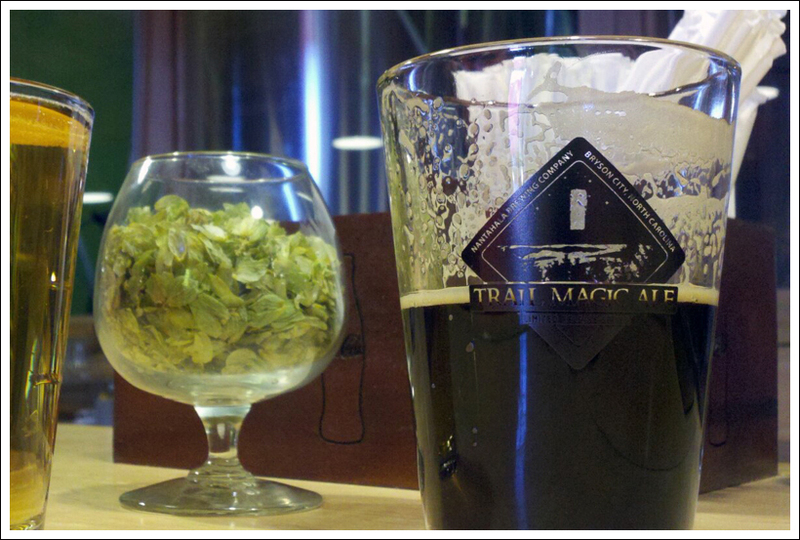 The Nantahala Brewing Company – a good post-hike stop in Bryson City. To be honest, I was really unhappy with my photos from this hike. Waterfalls, sunny conditions and photography simply don’t go together. So, I left this hike feeling a little disappointed with the photos I had to share. That regret quickly faded after a few beers at the Nantahala Brewing Company. What an awesome place! If you like craft beer, don’t miss a visit. After beers, we went for pizza at Anthony’s. It hit the spot and we loved our outdoor table facing the train depot. I thought our experience with the waterfall hike was over, but the next morning we woke to gloomy, drizzly weather. Since it was such an easy hike, we went back and did it again so I could get better photos. And the second time, we added the .6 mile loop to visit Juney Whank Falls to the trip. These falls required a short, but steep climb, but may have been the prettiest of the three! And the better photos gained from a second trip around made this hike twice as nice! These stats are from the first time we hiked the loop, so Juney Whank Falls are not included in the MapMyHike mileage or elevation. Elevation Change – About 630 ft. Trail Conditions – 4. Most of the trail is gravel except for the Loop Trail. 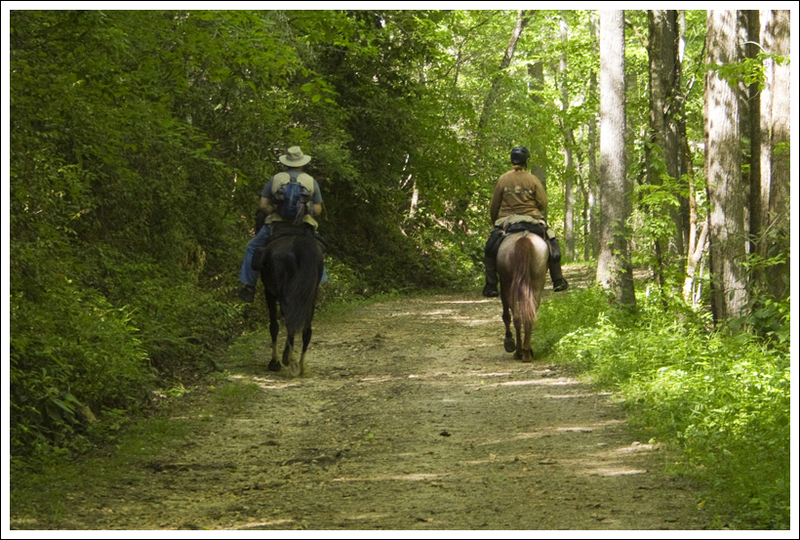 This is a multi-use trail and you will see hikers, bikers, and horses on this trail. The trails were in great shape with no blowdowns or rough footing. Views – 0. No scenic views from the trail, but this is more for the waterfalls. Streams/Waterfalls – 5. 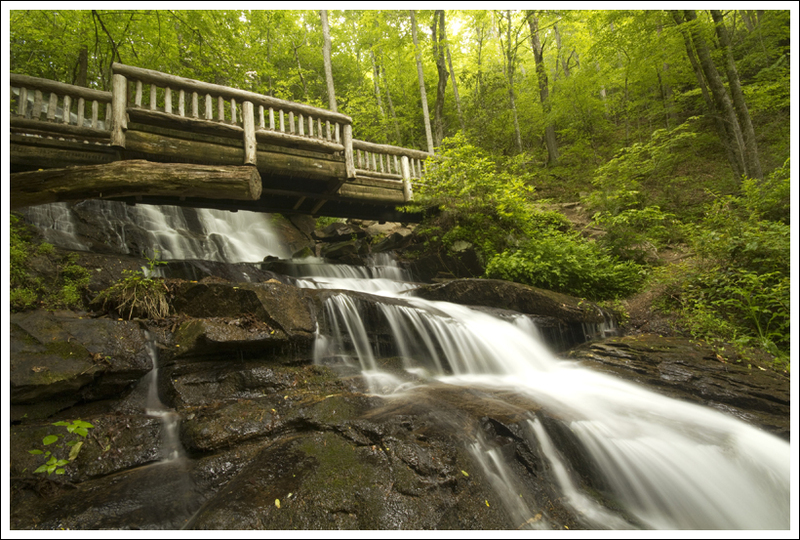 You’ll have the best stream views along Deep Creek and three gorgeous waterfalls. Wildlife – 2. Don’t expect larger wildlife due to the crowds of people on this trail. We did hear lots of pretty warblers in the tree. Ease to Navigate – 4. Good signage at the trail junctions for the most part except for coming off the Juney Whank falls trail. Solitude – 1. Expect to see lots of people for most of the trail. A lot of people choose not to do the Loop Trail. Directions to trailhead: Take exit 67 off of NC-74 towards Veterans Blvd. Go .6 miles and take a right on Main Street/NC-19. Take the second left on to Everett Street. You’ll see signs directing you to Deep Creek Campground. Go .3 miles and take a right on Depot Street. This road makes a quick left on Collins Street and then a quick right to continue on to Depot Street. This becomes Deep Creek Road. Go .3 miles and take a left on to West Deep Creek Road. 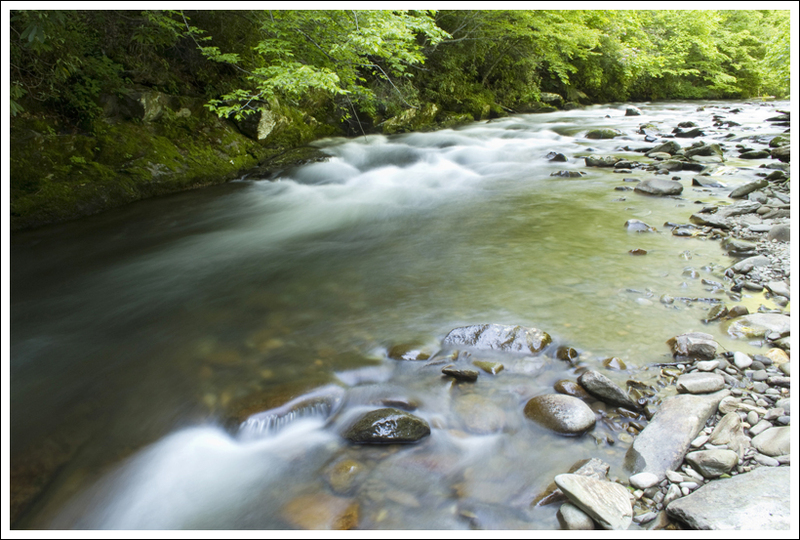 Continue 2.4 miles until you enter the Great Smoky Mountains National Park – Deep Creek campground. A parking lot is on the left. The trailhead starts near the drop-off roundabout next to this parking lot.